As I type this the R/V Nereid is surveying the Grand Manan Basin in the Bay of Fundy. I’m back at the field house waiting for Internet technicians to arrive to help sort out some of our own going Internet problems. Working in the field has many challenges and keeping a field house in good working order (including Internet) is just one of those many challenges. 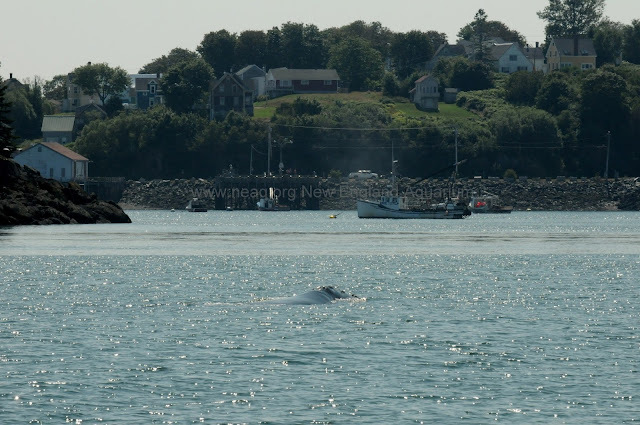 However, it also seems that finding right whales this season is a bigger challenge then any of us anticipated. Meanwhile the offshore researchers on Shelagh also have their work cut out for them. They have been covering approximately 100 nautical miles of trackline each day. The following is a quick summary of their trip so far. Day 1: (August 16): Left Campobello Island around 5:00 AM and headed for Grand Manan Banks via Grand Manan Channel. Cut across the mouth of the Bay of Fundy and ran about 2/3 of their planned tracklines on Lurcher Shoal. The only large whales seen the entire day were two humpbacks and two fin whales. Spent the night in Yarmouth, Nova Scotia. Day 2: (August 17): The crew left Yarmouth prior to sunrise and continued tracklines of the remaining 1/3 of Lurcher Shoal. From Lurcher they headed to Roseway Basin. In addition to reporting lots of leatherback turtles, jellies and common dolphins the team found five right whales on the western edge of Roseway! Spent the night at sea. Catalog # 2360 Derecha was seen by the crew of the Shelagh on August 17. Deracha is an adult female first seen in 1993. This photograph was taken in 2010 but we will be sure to post a recent one once the team arrives home. Day 3: (August 18): Full day of survey in absolutely amazing sighting conditions. The crew had a sea state 2 most of the day and worked near the NE corner of the Roseway Basin. While the team did report seeing 2 Sei whales, a few mola molas and basking sharks they also noted a lack of birds. The crew spent the night at sea. Day 4: (August 19): The crew was up and on watch by first light. The working conditions were more difficult and work continued in a sea state 4 and 5 for most of the morning. 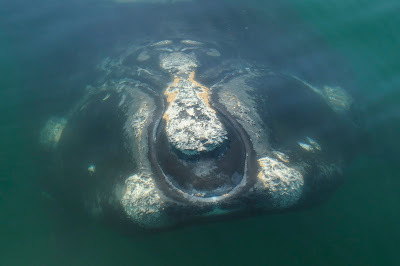 Despite the difficult conditions the crew documented another right whale! The crew headed into Cape Sable Island by the afternoon for fuel and a solid night of sleep. 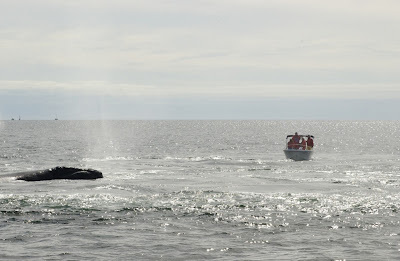 Day 5: (August 20): The crew reports no right whales. They spend the night at sea. 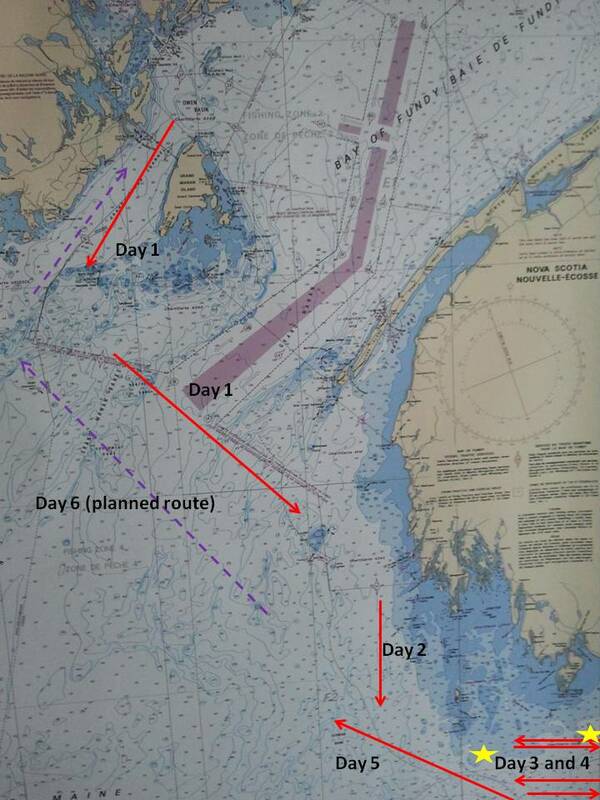 The approximate route of the Shelagh on her offshore cruise to find right whales. Tracklines are not to scale and right whale locations are approximate. In my last post I asked folks if they had any questions for the crew of the Shelagh. We got some great questions and many will need some time to answer. The questions have given us some great ideas for future blogs and so we will try our best to answer them all. For now I’m going to answer the questions that were the most appropriate to ask the crew while speaking via satellite phone. Question: Are your bunks big? Can you stretch out and roll over? Answer: (Philip reports)While the bunks are not overly spacious they are comfortable. Everyone can roll over and Kelsey (the tallest member of the team at 6’1”) reports that she can lay flat and stretch her legs out. How many miles of trackline does it take to find a right whale? Sounds like the beginning of a bad joke, right? Unfortunately, it’s actually how some of us are starting to feel up here at our field station in Lubec, ME. Okay, to be honest, we have been out in the Bay of Fundy only three days so far this season, but we are anxious to find right whales. The reality is that we are working and surveying long, hard hours, and collecting amazing and important data. Data collected that shows the absence of whales in a habitat is just as important as data that shows the presence of whales (even if it makes our days a little less exciting). Our last day out last week (August 7) was a great day. We had amazing weather, great visibility and we felt really good about our extensive tracklines (the green track) on the eastern side of the Bay of Fundy. At one point we came across a small pod of about 25 of Atlantic white-sided dolphins (see the little blip in lower left of the green trackline) that included three mom/calf pairs! It was a nice break from our long survey day to spend a little time in the presence of such quick and agile mammals. It certainly felt like a reward for our hard work and survey effort. Beautiful markings on the sleek body of the Atlantic white-sided dolphin! We are excited for this coming week. Hopefully we will get some good weather and will be able to continue surveys for right whales. Additionally, we are currently prepping for our extended offshore work beyond the Bay of Fundy. Be sure to stay tuned to see what our offshore team might find in other Canadian habitats. Despite the forecast of a busy field season complete with five research projects, the first few days here in the Whale House were fairly calm and quiet! Eight researchers gathered to refresh their memories on protocols and equipment as the last of the house cleaning tasks were completed (how does a house that hasn't been occupied for 10 months get so dirty?!). Knowing that we all arrived with the itch to get out on the water, Philip (our captain for the week) had been keeping an eye on the weather for our first survey. After three days of thick fog and occasional rain, August 4 promised us a clearing into the Bay of Fundy, and so we all went to sleep on Saturday with hopes of waking up to the absence of the fog horn. 5 AM sure can roll around quickly! 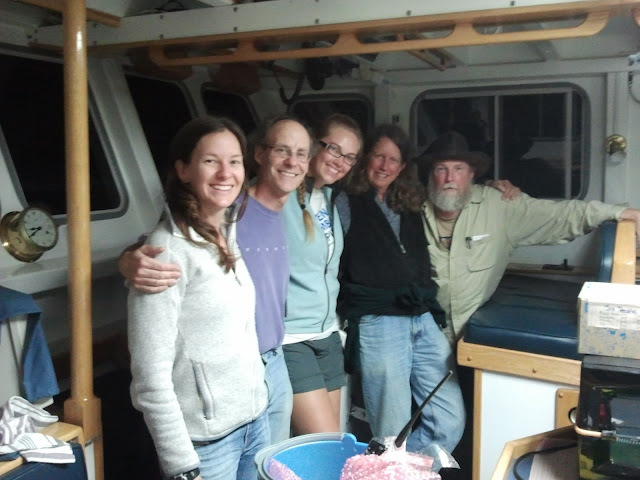 After consuming necessary cups of coffee and loading equipment onto the Nereid, the team got off the dock around 6:15 AM. 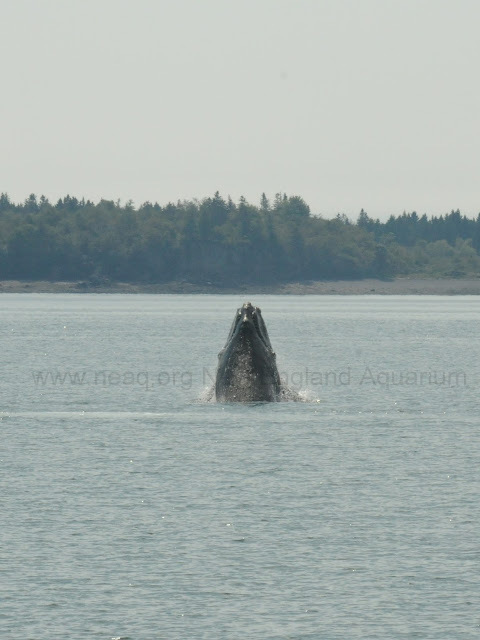 We crossed the Grand Manan Channel with a few sightings of harbor porpoise and sighted some whale blows well in the distance. As we passed North Head on Grand Manan Island, the blows revealed a few fin whales, and so we continued to head east. After several hours of survey and many more harbor porpoise later, we came across a large ocean sunfish (Mola mola) and got to spend a few minutes in close proximity to the heaviest bony fish in the sea! 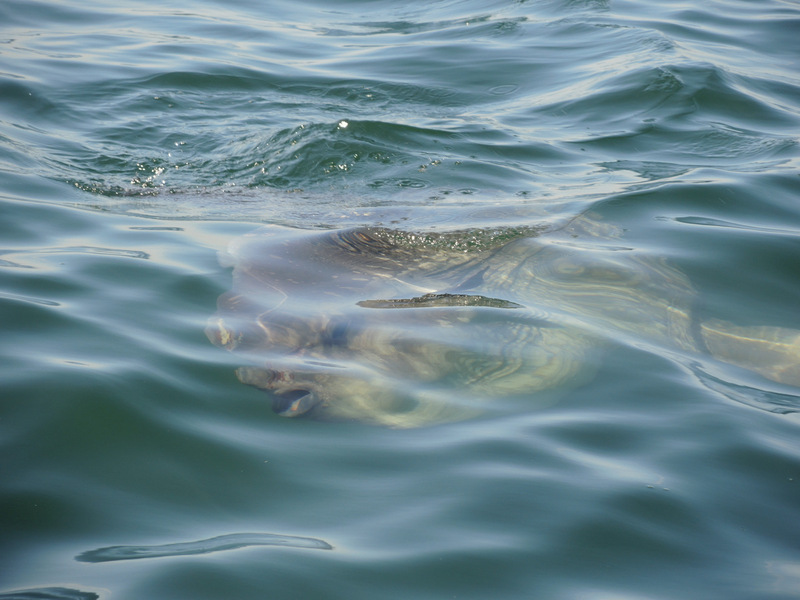 We didn't know it at the time, but the close encounter with the ocean sunfish would turn out to be the one of the main highlights of our first survey! After miles of trackline we did encounter a couple more fin whales, but that species were the only large whale we sighted. We decided to head north towards the Wolves islands so that we could squeeze in a little more survey before the seas became too rough—with the wind kicking up and the tide running strong, our sea state was rapidly increasing. Once the Nereid had become a little too "bouncy" and our observers on the bow got their feet more than just metaphorically wet, we chose to end the survey. Although we didn't sight any right whales, we had a great trip that let us work out some kinks and get back into the swing of things. And when we do come across our first right whales, it will make those sightings even sweeter! Check out previous mola mola sightings! The summer migration of researchers has begun! The first wave of researchers is settling into the field station in Lubec, Maine. We are excited about the various research projects happening here this year- five in total! 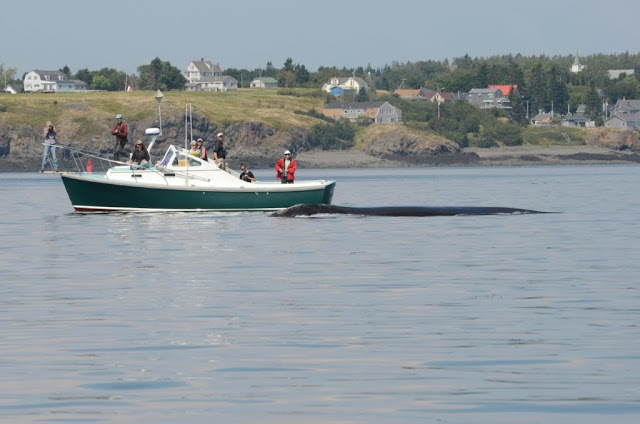 Thanks to funding from Irving Oil and the Island Foundation, we will be conducting our usual surveys into the Bay of Fundy on the R/V Nereid to collect photographic, genetic, and behavioral data on right whales. This is our 34th year - making it one of the longest, uninterrupted studies of any of the great whales! Later in the season, another team from the New England Aquarium will arrive to conduct work on collecting blows from right whales for hormone analyses. Researchers appreciating the size of an adult right whale. 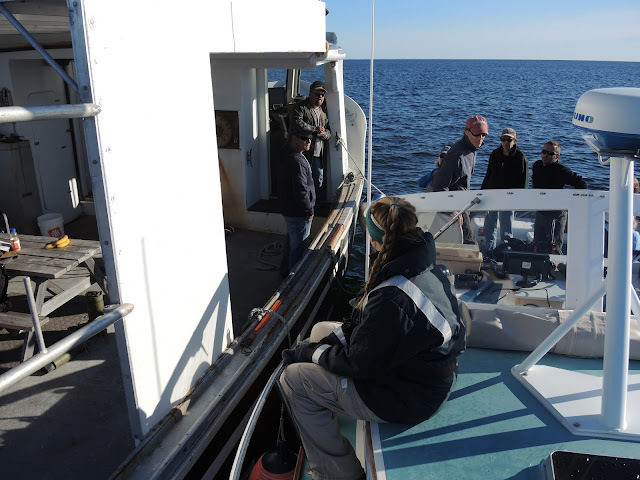 Within the next few days, a team from Syracuse University and the Northeast Fisheries Science Center will arrive to conduct their 4th season of mother/calf behavior and acoustic work in the Bay. 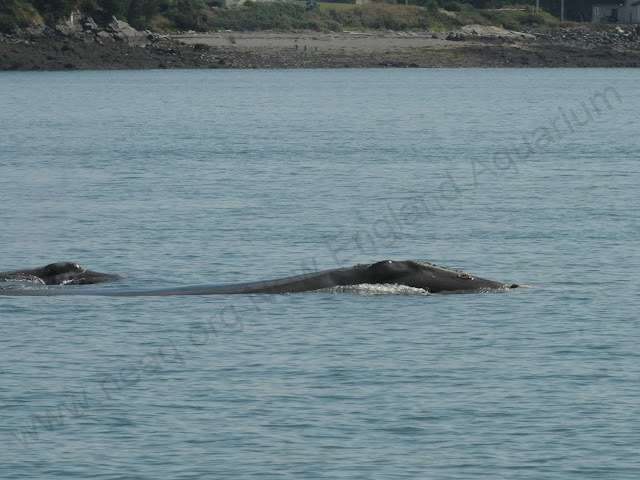 They have already documented some mother calf pairs earlier in the year on the calving ground in the southeast US and in the spring feeding area in Cape Cod Bay. The 2012 acoustic team leaving dock in the early morning. Right whales are known to occur in other areas in Canadian waters. With funding from the Habitat Stewardship Program from Environment Canada, teams from the Canadian Whale Institute and New England Aquarium will be conducting surveys south and east of the Bay of Fundy to improve our understanding of other Canadian right whale habitats. An aerial survey team will be flying surveys between Roseway Basin and Bay of Fundy, as well as east of Roseway Basin. Roseway Basin has been an important habitat for right whales in the past, but surveys in the area have been sparse in recent years. The aerial work will be complimented by a team from Lubec heading out for several vessel based trips throughout the season. There has been a lot shifting in right whale movements this year- so it is a perfect year to have added these components to our research. There is a lot to look forward to- so stay tuned!